every time i walk by i am tempted to use that atm. they’re good. seriously. who would have thought that anyone employed at paul’s food center would be so cunning? Is this legal? 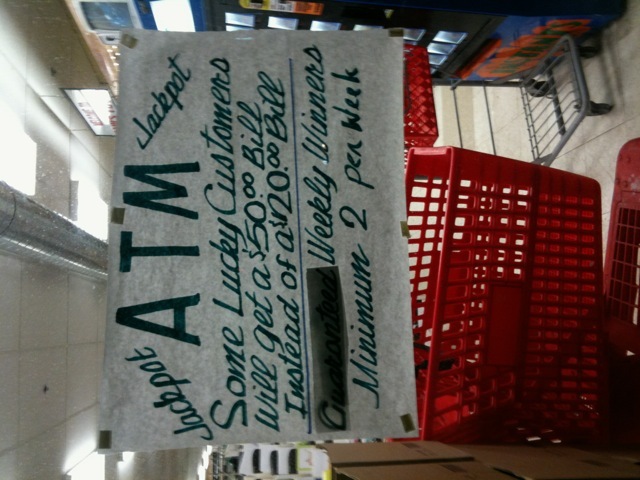 Doesn’t the government have to monitor games of chance that use phrases like “guaranteed” and “jackpot”?!? This is even fishier than Paul’s Food (C)enter’s frozen meat section. Is this why Paul’s gets robbed all the time? Get an account at Bangor Savings. They refund all ATM fees!!! i should have! i have my mortgage through bangor savings, and they’re the balls.